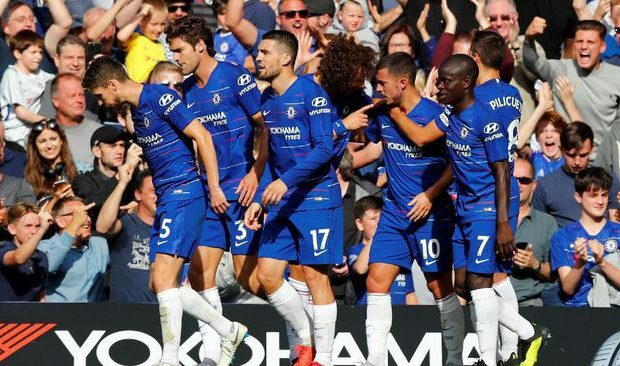 Chelsea won 4-1 at Cardiff City in the Premier League match in 2018/2019 season at Stamford Bridge Stadium on Saturday (15/9). Cardiff City gave Chelsea a surprise by giving an attack in the early minutes of the first half. But Chelsea did not stay silent. Through striker Olivier Giroud, Chelsea pose a danger to Cardiff. Unfortunately the Frenchman’s header in the seventh minute was wide. Two minutes later Giroud again tried to score to bring the hosts ahead. It’s just that, for the second time the former Arsenal player did not manage to break into Cardiff goal. Despite continued pressure, Cardiff were finally able to surprise the hosts by scoring the first goal in the 15th minute through Sol Bamba. The goal was created thanks to feedback from Sean Morrison. Morrison’s header in front of the Blues goal was successfully cheated quickly by Bamba through the opponent’s players. Saving the right foot of Bamba, goalkeeper Kepa Arrizabalaga could not be anticipated. In the 24th minute, Chelsea almost equalized. But Pedro’s left-footed shot was just sideways thin from the right side of Cardiff goal. Chelsea’s effort to equalize was created in the 37th minute through Eden Hazard. Shortly after receiving a pass from Giroud, Hazard immediately fired a hard shot with his right foot into the right corner of goalkeeper Neil Etheridge. With his individual qualities, Hazard scored again in the 44th minute while closing the first half with a 2-1 advantage. In the second half, Chelsea’s appearance remained impressive. In the 63rd minute Pedro tried to add a goal for Chelsea. But the Spaniard’s shot was blocked by Cardiff’s back line. Cardiff’s back line came under pressure from Chelsea. This time it was Hazard’s turn to threaten in the 69th minute. It’s just that Hazard’s effort to score a hattrick can be thwarted by the visitors’ defense wall. In the 81st minute Hazard scored a hat trick through the penalty spot while adding to Chelsea’s advantage. The penalty was given by referee Jonathan Moss after Willian was dropped by Bamba. Hazard kicked to the left side successfully beat the Cardiff goalkeeper. Willian fulfilled Chelsea’s victory to 4-1 in the 83rd minute. Utilizing Marcos Alonso’s pass from the left side, Willian’s hard shot from outside the penalty box could not be anticipated by Etheridge. Chelsea closed the match with a 4-1 victory. The victory made the Blues to the top of the Premier League standings shifting Liverpool which in the previous game just beat Tottenham Hotspur 2-1. Despite both collecting 15 points, Chelsea are ahead on goal difference. Chelsea: Kepa Arrizabalaga; Cesar Azpilicueta, David Luiz, Antonio Ruediger, Marcos Alonso; N’Golo Kante, Jorginho, Mateo Kovacic; Pedro, Olivier Giroud, Eden Hazard. Cardiff City: Neil Etheridge; Bruno Ecuele, Sean Morrison, Sol Bamba, Joe Bennett; Victor Camarasa, Harry Arter, Joe Ralls, Junior Hoilett; Bobby Reid; Danny Ward.